Jicho Consulting is one of the South Africa’s leading wholly black owned Information and Communication Technology, founded and managed by young enthusiastic South African professionals with vast industry experience and exposure. We offer inclusive ICT solutions from end-user to infrastructure solutions. Jicho Consulting is fully committed and dedicated to the successful implementation of ICT projects, thus we offer support (change management, training & skills transfer) and user hand-holding throughout the projects we work on to make sure that we don’t leave our clients with white elephants to gather dust in their servers. Our solutions are built in partnership with our clients in order for them to fit in the client’s environment. We view our clients not just as mere clients but our partners who we work with side by side to deliver projects using the latest technology. Jicho employs highly qualified specialists with relevant experience, expertise and are professionals in the field of information technology. With our extensive ICT experience, we have developed partnerships with best of bread OEM's around the world, allowing us to deliver true world class solutions from open source to commercial off-the-shelf (COTS) solutions. 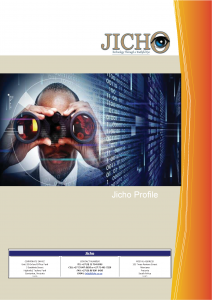 We Provides Business Consulting, Technology, Engineering and Outsourcing Services to help partners Innovate and Transform their Businesses, Jicho uses its IT Business Process and Strategic Consulting to help client transform their business, with Minimum Risk and disruption giving the client greater flexibility, higher efficiency and lower cost hence building a Strategic Long term partnership. To be a leading preferred ICT partner for the implementation of intelligent and compatible solutions in South Africa and beyond. To sustain the relevance of ICT through innovation and forward thinking initiatives. RFB 2005/2015- The Acquisition of the Personal computers, computer peripherals, consumable and services.